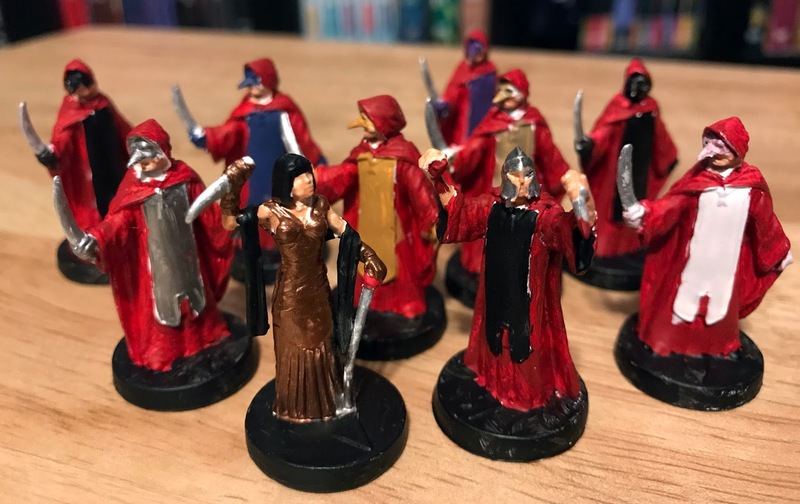 Here's another batch of Fortune and Glory tokens; this is a group of cultists. Once again, I'm embarrassed by the sloppiness on display, but I'm quite fond of how the gold dress turned out, and I even tried to innovate a little by painting some blood on the dagger of the foreground helmeted figure, along with what I imagine is the heart in his other fist. As you can see, my paint application is still wildly uneven; I'll have another go at these to see if I can fix some of the rougher spots. I feel like the woman figure could use a bit of detail in the face to draw out her features, but that might be a bridge too far for me at this stage of my (cough cough) painting career. Try an ink wash; it will add some shading to the low parts of her face. After, you could add a little more flesh colour to the forehead, cheeks and chin for highlights, if you wished. I will give that a shot! Also I was wondering if those detail pens I used on my Federation ships might work. Probably a bit too sharp, honestly...unless you can actually draw!